Guess how much she got from the ‘heist’. A woman thought she hit the jackpot when she stumbled upon a tray of free red packets in a temple in Teck Whye Lane. While most people would have taken one or two of them, the auntie took almost all of the 500 ang baos available for guests to help themselves with. 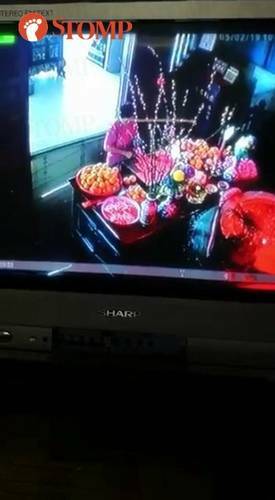 The CCTV footage of her ‘heist’ was shared to STOMP by Eric, a temple volunteer who places ang baos every Chinese New Year. He did not provide the exact location of the scene of the crime that was the temple in question. The woman managed to pull off the stunt when no one was looking on Chinese New Year’s day (5 Feb) at around 12 pm. Each red packet contains two 10-cents coins and a lucky 4D number. Let’s do some math here, 480 of those packets would make… S$ 96 worth of cash! Not bad for a temple haul. Eric mentioned that the temples were meant to give visitors blessings and was disappointed to learn what had happened. When he reviewed the CCTV footage, he saw the woman going in and out the temple multiple times. “In five or six goes, she took all the red packets and placed them in the bag that she was holding”, Eric said. “Technically, she did not commit a crime as the red packets were meant for temple visitors. However, I hope to create awareness about the incident. “We have had previous instances of people taking slightly more than they should and we would just talk to them nicely. But nobody has ever taken everything like this. While it might be easy to assume the aunty is of poor taste and questionable character, we should keep in mind that people’s actions often have a reason. Within the last few years, data from the Ministry of Social and Family Affairs (MSF) show that poverty in Singapore is growing, with 40% more families requiring financial support. Perhaps it would be wise to use this incident to reflect on ourselves as a society rather than singling out a single woman who got ahead of herself— even for a moment.